Quidam de Revel, bay Selle Francais Stallion, by (Jalisco B / Nankin) born in 1991, standing approximately 16.3 hands. uidam de Revel is one of the best performers of his generation. In 2004, Quidam de Revel topped the World Breeding Championships Jumping Stallion ratings for the second year running, establishing himself as the pre-eminent – and most expensive – living sire of jumping horses. 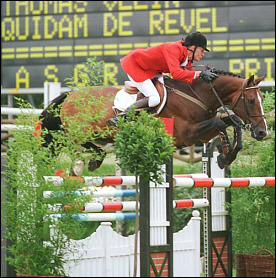 Quidam was a jumping star as a member of the French Olympic Team, and later with Thomas Velin. He placed many times in International competitions and was the recipient of the Team Bronze Medal in the Olympic Games in Barcelona, and was 4th Individually with Hervé Godignon. He won the Rome Grand Prix, the New-York Grand Prix, and performed several double all clears for France in many Coupes des Nations. In 1996, ridden by Thomas Velin, he came 2nd in the Copenhagen Grand Prix, and 4th in the Young Riders European Championship. In 1997, he won the CSI Hannover Grand Prix, the CSIW Aarhus Masters in Denmark, and was placed in many International competitions such as CSIW in Paris and Göteborg. 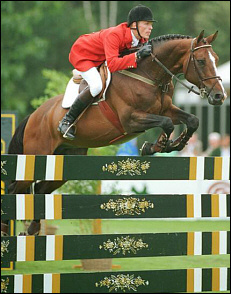 In 1998, he won the CSIO Helsinki Grand Prix, and was placed in the Grand Prix CSI in Hannover, Oslo, Düsseldorf, and in the World Cup in Geneva. In 1999, he came 9th in the CSI-A Valkenswaard Grand Prix and was placed in the CSI-W in the Oslo Grand Prix. 1998 - 3rd Maubeuge CSI, Mixed comp. 1998 - 2nd Ypaja, Mixed comp. 1995 - 4th Zurich, Mixed comp. 1994 - 5th Millstreet CSI, Mixed comp. 1994 - 5th Oslo CSI, Mixed comp. Quidam de Revel has sired many brilliant performers who have inherited his amazing sporting ability. In 1998, 31 of his foals were taking part in the Grande Semaine de Fontainebleau. More than 35 of Quidam’s stallion progeny have become approved stallions around the world. Quidam’s pre-eminence as a sire was confirmed at the 2002 WEG in Jerez where he was the sire of more showjumping participants than any other stallion. Successful offspring include: Goldy, Guidan, Circa Z, Tlalloc La Silla, Nabab de Rêve, Dollars Boy, Hermès St Lois, Happy Villers, Jadis de Toscane, Belsedène d’Amaury, Bamby II, Baie Mahault, Coucou des Vivreau, Demie-Lune, Darios V, Furka du Village, Huppydam des Horts, Eve des Étisses, Daibolo du Parc, Dolovia de Sapaie, Drakkar de Phaële, Diam de la Ressée, Daibolo du Parc, Étoupe, Bianca d’Amaury, Eyken des Fontenis, Electra d’Amaury, Éburovic Granpré, Coco Chanel Trèfle, Billy de Forcilles, Happy Villers. Jalisco is a legend in his own right and competed in the 1988 Seoul Olympic Games, but Quidam’s dam was also a star. Dirka, despite being only 163 cms, won at international level with Nelson Pessoa, before being given to Xavier Leredde who made his junior international debut on her. Dirka’s dam, Ondine de Baugy, produced five broodmares and from them came the stallions Sheyenne and Sioux de Baugy. Ondine’s dam, Nadine, produced five foals, all by Nankin. 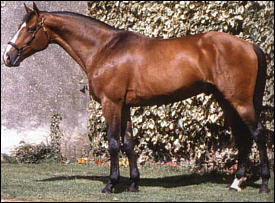 Troubadour B, won the 6 year old final and jumped at international level, Uriel, the most influential national stallion of the Selle Français book, and star of the great St Lô stud, Commander, an international competitor for Switzerland, Daguet de Baugy, a CSI winner for Belgium, and Voulzie, the dam of Furiel de Baugy.